Autumn is a great time for patrolling your yard/garden. As frost kills formerly lush vegetation, areas hidden by summer are revealed. When I removed a mountain of dead Japanese Stiltgrass from a spot in my north garden yesterday, I discovered a thriving, still-green native blueberry that I planted three years ago. The hideous invasive grass had grown so fast and thickly that I forgot the little blueberry was there. I apologized for the neglect, but fortunately, I don’t think the blueberry was much hindered. The best surprises yesterday appeared as Wonder Spouse and I walked beside our creek. We’ve been very dry here; we’ll likely be placed into the Abnormally Dry category by the meteorologists next week, unless the rain promised for tomorrow is much more bountiful than predicted. Despite the drought, our creek has more water in it than is usual for such conditions. The water itself barely flows. These signs tell me that beavers are working downstream; their dams prevent the creek water level from dropping. Local inhabitants have noticed the change. 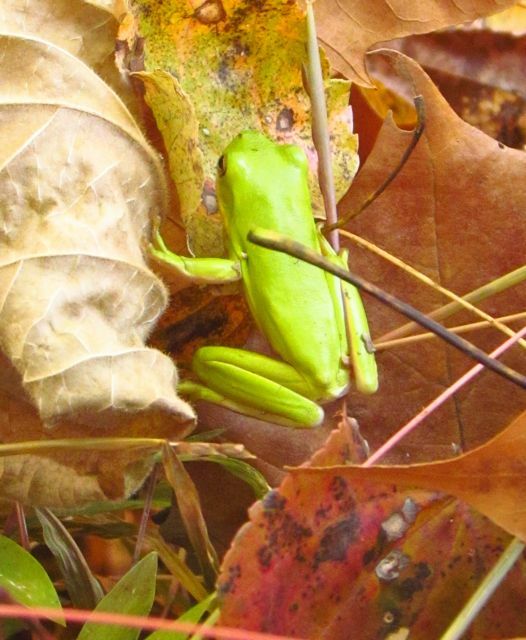 Perched on brown leaves recently discarded by towering Sycamores, we discovered two very bright Green Treefrogs nearly side by side. In Summer’s greenness, I would certainly have passed right by them, but their color contrasted vividly with the browning landscape, making them impossible to miss. Both frogs seemed astonished that they were spotted. Perhaps the water level in the creek and the unseasonably warm air made them think they were still camouflaged by Summer’s green cloak. We wished them well, advised them to seek warmer quarters ahead of the latest cold front due tomorrow, and continued upstream. After only a few steps, as we passed a deeper spot in the creek, several ducks flew up and away in a whoosh of wingbeats. They departed so quickly that we didn’t get a good look, but by their size and general conformation, we suspect they were Mallards. The source I linked to says these ducks are now fairly common throughout my state, and our environment seems to be exactly what they seek this time of year. During Spring, I often see Mallards, Wood Ducks, and some years even Canada Geese. All three species have raised young ones in our wetland. Right now, the recently arrived beavers are far enough downstream from us that we are gaining the benefits of their presence without any negative consequences. As our forest goes bare for Winter, our trusty binoculars will get much use as we observe increased numbers of wetland-loving wildlife. I confess it is possible for me to lose hours this way. But beavers are hungry rodents, ever expanding their reach to fell trees for food and dam-building. If they approach too closely, the creek will jump its banks and create a shallow pond across our floodplain. The last time this happened, the water covered an acre and a half, trees were being felled at alarming rates, and those that still stood were dying as the water deprived their roots of oxygen. When this happened, we felt obliged to take steps we did not want to take. I hope circumstances won’t force us there this time. We made all of these discoveries from one brief Autumn walk with eyes open and ears sharpened. I encourage all my readers to try this. Step outside, into your garden or onto a nature trail. Turn off your electronic devices, remove ear buds. Walk softly through the landscape with your senses tuned for subtle changes. When you really look, you will see. 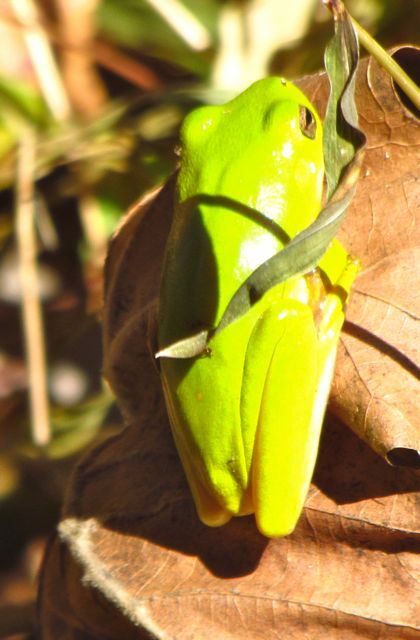 This entry was posted on November 12, 2012, 4:40 pm and is filed under Invasive Exotic Species, Native Wildlife, piedmont gardening. You can follow any responses to this entry through RSS 2.0. You can skip to the end and leave a response. Pinging is currently not allowed.